Thank you for your interest in 2200 Series iDrive Belt Conveyor System . We will be happy to discuss the pricing in more detail with you please fill in your details below and somebody will contcat you back with a quote. Alternatively please call us on 01772 690656 and please reference our part number - 2200 Series iDrive Belt Conveyor System . The 2200 iDrive is perfect for when space is at an absolute premium. Fortified with Dorner innovation and quality. The 2200 series illustrates Dorner’s tour of enhancements and features for diverse applications and requirements. From a very wide range of motors in 1ph, 3ph and DC. Drive options for the belt drive including end drive, mid drive, centre drive, gang drive and common drive. The already compact 32mm rollers at infeed and outfeed can be reduced to knife edge rollers 8mm in diameter if required. The 2200 series is probably the most versatile standard belt conveyor platform in the world, with options for modular belts, timing belts and now a pallet conveyor system based on the 2200 series frame. We offer an industry leading 10 year warranty on all Dorner conveyors. No other company in the industry offers a longer warranty. Terms and conditions apply. A vast array of side guides can be used to help marshal your product in the correct direction and the range of standard design stands and supports can help you to construct the perfect low profile conveyor. Flying leads remote start/stop with integrated direction switch and speed pot. Internally mounted 24V DC motor and controls save space in tight work spaces. Low voltage means reduced setup time and no special skills required to set up and wire the total conveyor. Control switches simply located on a high impact resistant casing. Standard 2200 Series 32mm diameter knurled drive roller for assured product transfer. V-guided belts available for reliable belt tracking. Incorporates the best features of the 2200 Series. Rack and pinion belt tensioning for solid, fast and square adjustments. Dorner's built-in belt tension indicator for belt stretch monitoring. 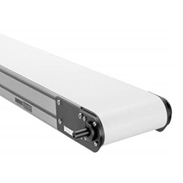 Conveyor body has T-Slots for fast mounting of mechanical, safety and automation components.